Linfield manager David Healy. Pic by Pacemaker. An Andrew Waterworth strike just seconds into the second half was the difference between the two sides and the Blues are 12 points clear at the top of the table with only four games left. 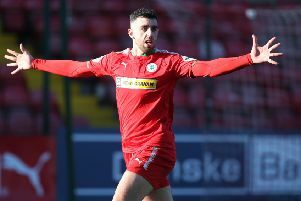 And Healy - who knows a point against Crusaders in the next match will seal the league title - praised his players after the victory over their nearest rivals. “The standards the players have given us for 34 games so far is immense,” he said. “I am proud of every player in that dressing room and the hard work is done. We have a chance next Saturday to go and win the league. 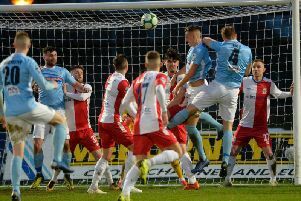 “Ballymena threw everything at us and couldn’t score against us. I think that is the third or fourth game in a row they haven’t scored against us. “They threw everything at us and that is credit to the players in the dressing room. Ballymena have had an incredible season with good players so we knew we had to dig deep. And the former Northern Ireland international says getting the hands on the Gibson Cup this year would be extra special.